The controversy over Uber’s impact on Manhattan traffic has been settled. Uber, Lyft, and other app-based ride services are unequivocally worsening gridlock in the Manhattan core as well as northern Manhattan and the western parts of Queens and Brooklyn, according to a report released today by transportation analyst Bruce Schaller. The new ride services, known as transportation network companies, or TNC’s, last year caused a net increase of 600 million vehicle miles traveled in the five boroughs — a 3 to 4 percent jump in citywide traffic, Schaller found. This trend marks a troubling inflection point — for the first time in many years, car-based services, not transit, account for most growth in travel. To head off a downward spiral of increasing traffic and declining transit use, it’s incumbent on Governor Cuomo and Mayor de Blasio to prioritize projects with wide-ranging impacts on the transportation system: subway signal upgrades, citywide off-board fare collection for buses, a comprehensive expansion of bus lanes and transit priority at intersections, and road pricing that factors in the impacts of TNC’s. In 2013, the last year before Uber’s presence was felt, use of subways, buses, and bicycles grew substantially (see below). But by 2016, net growth in travel by Uber and other TNC’s far outstripped growth in those modes (see above). Most of the upsurge is occurring outside the city’s Central Business District (Manhattan below 60th Street), Schaller reports. Nevertheless, he identifies growth in use of TNC’s as a prime cause of the 11 percent slowing of traffic in the Manhattan CBD from 2013 to 2016 noted in the mayor’s management report last September. Schaller is highly regarded in transportation circles, and his report — “Unsustainable? — The Growth of App-Based Ride Services and Traffic, Travel and the Future of New York City” — will be widely read and carefully studied. Before serving as a top deputy to transportation commissioners Janette Sadik-Khan and Polly Trottenberg, Schaller’s career included stints at MTA NYC Transit and the city’s Taxi and Limousine Commission, and his annual NY Taxicab Fact Books made him the go-to expert on for-hire vehicles. In a marked reversal from the transit-oriented growth that lasted from 1990 to 2014, growth in for-hire vehicle use (TNC’s, yellows, greens, and all car services combined) is outstripping growth in transit ridership, making it the city’s leading source of growth in non-auto travel. The estimated 7 percent net addition to vehicle mileage caused by TNC’s in Manhattan, western Queens, and western Brooklyn is the same magnitude as the decrease in vehicular travel that was expected from the 2007 Bloomberg congestion pricing proposal. These trends only became apparent in the last year and a half, as TNC ridership tripled between June 2015 (the end of the period that City Hall examined in its December 2015 for-hire-vehicle transportation study) and the fall of 2016. These developments are virtually certain to continue, Schaller asserts, fueled not just by the convenience, dependability, and cachet of Uber and other TNC’s, but by their low fares. Traditionally, a ride in a taxicab was four to five times as expensive as a subway or bus ride, which acted as a brake on usage. Now, however, “TNC fare offerings for shared trips during rush hour in Manhattan put TNC fares at less than twice the transit fare, dramatically weakening the disincentive to travel by auto,” Schaller concludes. The app-based ride services were expected to confer an efficiency upgrade as they replaced taxi cruising (driving between fare trips) with swift arrival of the nearest available vehicle. Instead, deadheading is more prevalent with TNC’s, as Schaller found by painstakingly examining trip records available from the Taxi and Limousine Commission. Whereas taxi cruising tends to add seven to eight miles for each 10 miles of fare trips, the app-based vehicles tack on 12 to 13 miles. The difference is a big force-multiplier to gridlock. The prospect of unconstrained growth in TNC traffic — and the concomitant worsening of gridlock and rise in emissions — lends new urgency to efforts to improve subway and bus performance. Instead of dubious projects like Cuomo’s AirTrain to LaGuardia and de Blasio’s Brooklyn-Queens streetcar, the city’s political leadership needs to shift focus and deliver projects that will speed up the transit system as a whole. Modernizing subway signals to allow trains to run closer together, speeding up bus boarding with off-board fare collection, and prioritizing transit on city streets are “far more critical than headline-grabbing but low-ridership distractions like the LaGuardia AirTrain and BQX streetcar,” Schaller says. The report also “raises the need to return to the subject of road pricing,” he writes. The Bloomberg congestion pricing proposal won’t suffice, he notes, since it would have let for-hire vehicles operate all day and run up congestion costs while paying just one toll. The Move NY plan devised by traffic guru and former City Traffic Commissioner Sam Schwartz surmounts that problem via the on-board GPS now found in all TNC vehicles as well as yellow and green taxis. Charging for-hire vehicles by the mile and by the minute in the “taxi exclusion zone” (south of 110th Street on the West Side, and 96th Street on the East Side), as Schwartz proposes, would discourage their use and also add to revenues to finance transportation improvements. Read Schaller’s report and take the time to digest its implications. It touches on virtually every consequential transportation trend and policy question facing the five boroughs and stands as the most thoughtful and thorough analysis of New York City traffic and transportation issues since the Bloomberg years. Give it a deep dive, and join me in congratulating Bruce for advancing the discussion on many fronts. NYC is packed with Uber cars. Literally on every corner in Manhattan there are at least a dozen of Uber black cars double-parked, driving slowly, waiting for a ping, etc. I’m not sure who authorized this to happen but >40,000 Uber cars (and growing) are definitely having a negative impact on our traffic, air quality, and overall quality of life here in Manhattan. Schaller’s report looks great. Glad you’re spotlighting it. But, with the focus in title on Uber, I wonder if it’s confusing the symptom (car service/TNC’s) with the cause (ever worse-performing mass transit). As a regular mass transit user, I take my anger — at the rash of train delays, sardine-like crowds and lunatic weekend service strangulation, not to mention buses that crawl along and a failure to enforce bus lane rule — to be representative of how NYC transit riders are feeling these days. Since I don’t live or work in a transit desert, I can’t opine on the growth of TNC’s and less brand name car services in those parts of the city. Note that an analysis like Schaller’s will be impossible to do for Upstate cities under the TNC bills proposed by the governor and senate — which explicitly do not require trip data to be sent to state or local regulators. For sake of the Transpo Network Company bills, “Upstate” means anywhere not NYC. This is a surprising finding. Any ideas as to why this might be? I wonder how these app based for-hire services have impacted personal automobile usage citywide? It sounds like Uber/Lyft are taking riders off transit but what about the rides for which there is no viable subway/bus routes that can serve them? A cheaper-than-a-taxi ride to a place I can’t otherwise get to seems like a good service. Can Uber/Lyft be constrained from duplicating the A train? I guess that is the stolen trip that causes the traffic problem. Yes, that was the most surprising aspect of Bruce’s report, for me. Maybe it’s simply that the spatial density of Ubers (relative to demand) is less than that of yellows. Though that, even if true, doesn’t quite get to the heart of the matter. Schaller’s report addresses Uber and other TNC’s, so that’s where the news was. As my lede suggests, he answered a question that’s been on lots of folks’ minds for several years: are Uber trips additive or substitutional. Turns out the additive component is more than many of us had suspected. The other issues he touches on and that you mention are depressingly familiar to readers of this blog. As you know, neither our mayor, who controls the streets, nor our governor, who controls the MTA, evinces any grasp of transportation problems or exerts any leadership, despite an advocacy community (of which this blog is a key part) that exhorts and attempts to instruct them more or less continuously. There are any number of constructive outlets for your anger. Vent to your elected cit and state reps. Join the Riders Alliance. Contribute ($$) to Streetsblog. Rinse and repeat. ….there are 70,000 UBER vehicles roaming the streets. I think you’re right about the density of active vehicles. So many more taxis means one probably has to travel a shorter distance to get to you. Uber heads straight for you, leading to the short wait times people love, but probably has to go further to get there. Another factor is that customers hailing a traditional cab may first walk a few blocks to get to a known taxi-cruising street, catching a ride there, where as a ride service customer will just order the car to come into the side streets. Not that many at any one time, however. Vehicle miles traveled is the better metric. Just put bus lanes on every major street and let the TNCs sit in traffic while buses packed with people travel faster. It’s probably because Uber drivers take people into the suburbs and drop them off, which legacy taxis probably rarely do. Once an Ubersupport@checkr.com driver is out in the sticks, if that’s what you call your burbs, there are no riders there looking for a driver. Especially at night. Also as an Uber driver in Pittsburgh for the last 2 years I suspect that your local Transit experts are not looking at the rental car business. I bet their usage is down thanks to TNCs. A suggestion. Quit looking for the downsides of uber. In New York it has improved the moving around capability of millions of people who are no longer forced to travel on public transit or in monopoly cab companies like the one that tortured pittsburghers for 75 years until Uber and Lyft came along three years ago. Did you read the report? Did you read this post? 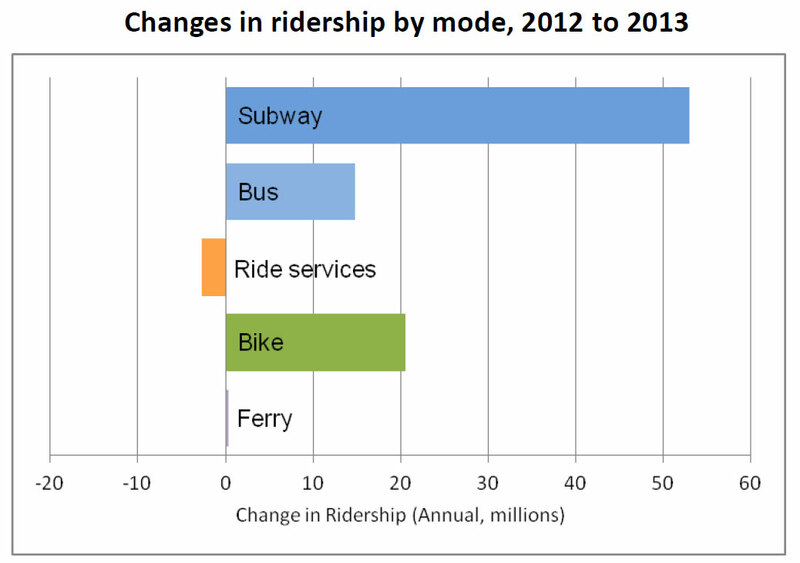 Question: is there analysis of where subway ridership has declined? In other words, is subway ridership down in the same areas where Uber and Lyft are growing? areas from 2013 to 2016.” Given the benefits and popularity of TNCs, seven percent is not much of a jump in miles driven and hardly cause for the experts to go on the warpath. We always had a cap on the number of yellow cabs based upon the number of medallions. Why not limit the number of TNCs? That may be OK for Pittsburgh and other cities with relatively low densities — as long as you ignore people who can’t afford private cab trips. But as the experts say (scare quotes don’t make them any less knowledgeable btw), it’s not only less efficient, it’s unsustainable in NYC, which only functions because millions get around every day on trains, buses, bikes, and their own two feet. Eventually everyone suffers, including Uber customers stuck in traffic. That’s what the experts are trying to head off. Once Uber and Lyft’s Venture Capitalists stop subsidizing 59 cents of the cost of every dollar and make the consumers pay their appropriate share, the TNC growth will cease. Imagine if the fares are then 2 1/2 times the current level, business will clearly suffer for their drivers and revert to yellow. In order to avoid that likelihood, Uber and Lyft must kill the yellow before the VCs pull the plug so that they are the dominant game in town. So far, the politicians and judges have allowed this to occur. When one of them dies as a result of the ambulance getting stuck in traffic is when there will be some change in policy. All my coworkers now switched to Uber pool to commute to the office. Some of which for less than 10 blocks. They pay 3$ a trip. This is frightninng. The worst part, is that they actually pay with pre taxed dollars. My 40 minute 7 mile commute gets 0. It’s an example of the Mohring Effect: Every additional car makes driving a car worse. In contrast, every additional transit rider makes riding transit better. An increase of patronage leads the operator to increase the frequency of the services. The quality of service improves. 7% might not have been enough for people to go on the warpath if city traffic levels were acceptable to start with and we had some breathing room. Unfortunately, we already have 3 to 5 times as many motor vehicles on the streets as are acceptable for efficient traffic flow. This huge number of motor vehicles causes congestion which delays everyone. It also results in excessive use of traffic controls like signals which cause unacceptable levels of delay for cyclists, pedestrians, and buses. I have nothing against Uber, taxis, or even private automobiles provided they’re paying a fair amount for the space they use, both to park and when in motion. Unfortunately, right now this space is usually “free”, or rather indirectly subsidized by everyone. If we charged a clearing rate for on-street parking, along with high-enough congestion charges so street traffic was free-flowing all the time, then we can accommodate Uber. Of course, if we do this, Uber will no longer be only a little more expensive than mass transit. It would be much more expensive, as would private autos or taxis. This would have the effect of rationing the use of these modes to keep traffic levels acceptable. The only reason Uber is “cheap” is because everyone is paying for it indirectly by increased travel times. Uber has obviously made city-living better and serves cab-starved suburbanites too — unless you think 70 million people in North America who use it every month are morons. Uber is probably ideally suited for trips which are made entirely in suburban and rural areas. Here any added traffic can easily be accommodated, and Uber can make living in these places without owning a car feasible for at least some people. In cities however exactly who has Uber made living better for? Certainly not the masses who still can’t afford to use it regularly (and for whom the subway is still often faster because of traffic congestion). For non-users all Uber has done is make their bus rides slower, make streets more congested, and added to already unacceptable levels of air and noise pollution. Even for Uber users, in many cases Uber may not beat the subway. The bottom line is Uber still at best benefits a minority in cities while making life worse for everyone else. Ditto for monopoly cab companies and private autos as well. In cities there just isn’t enough space for the small motor vehicle model to work. We’ve been trying for the last 75 years but it should be plainly obvious at this point that more space efficient modes like buses, subways, walking, and bikes make more sense for urban areas. You want a mobility solution for NYC to cover areas mass transit serves poorly? I can’t think of a better one than e-bikes. These have all the convenience of cars/taxis/Uber for users without the expense or downsides for nonusers. We have the crooks running Uber, exploiting & underpaying their drivers in London, too. Your public transport in Pittsburg was probably so bad, because, as is usual in the USA, no-one spent any money on maintenance or upgrades. Your obviously right-wing Rep-party rant about inefficient public transport is a bit of a give-away, you know …. Nice try, except that I’m not a Republican or a conservative. It was not a right-wing rant at all, it’s a libertarian one. Please learn the difference. Since the 1960s Republican and Democrat politicians have cooperated fully in establishing and funding Big Transit monopolies and rapid transit boondoggles in every major city; it’s a great bipartisan racket that gets politicians votes and benefits Big Transit’s employees and managers with fat salaries and obscene benefit packages and screws the public, especially the poor and minority public. It’s been going on for 50 years in cities like Pittsburgh, Detroit and NYC. Federal and state governments (Democrats and Republicans) have spent billions to build and subsidize shiny light-rail systems for suburbanites. Meanwhile, they’ve shortshrifted the bus systems that benefit inner-city people most and maintained the New Deal-era laws that prevented competition in over-regulated transit markets, whether it was buses or cabs. Pittsburgh, as I easily proved in 1994 in a series of articles for the Pittsburgh Post-Gazette, was probably the worst taxicab town in America. Like most cities in the USA, Pittsburgh had a terrible, monopoly taxi company that overcharged riders, overcharged drivers for daily leases, catered primarily to businessmen going to the airport, put crappy cabs on the road and religiously ignored the poor and minority neighborhoods that needed taxi service most. The abject failure of government-designed and -protected transit systems to serve the public for five decades across the USA opened the door for ride-sharing companies like Uber. Pittsburgh had less than 300 cabs for a metro area of more than 2 million when Uber came to town three years ago, flouted the local laws that had protected Yellow Cab for 80 years and attracted tens of thousands of grateful riders by providing cheap, reliable taxi service — especially for the poor and young. As for Uber’s drivers, maybe you should let them decide for themselves if they want to work for Uber. Apparently, 400,000 men and women of all ages in the USA, including me, think it’s a pretty good full- or part-time job. It’s especially nice to pick up a dozen rider every day who are thrilled to see you because they remember the bad old Yellow Cab days. So far, the only complaint I get from riders is that I showed up too soon. Off-peak subway frequency is based on peak crowding guidelines, so on average every additional passenger makes the train more frequent rather than more crowded. Not sure about ridership by station or line, but weekday subway ridership actually continued to increase between 2015 and 2016. It’s weekend ridership that is down so significantly that it’s down overall. As I posted on the other thread, I don’t agree with Streetsblog’s framing of this as being about rising surface traffic congestion. If anything, people abandoning the subway system to take a vehicle that is sitting in surface traffic congestion is a severe indictment of how bad the subway system is at serving our needs on the weekends. It’s really about peeling transit riders off transit when transit is its worst. None of the proposed solutions to increase transit ridership deal with the fact that it’s infinitely easier to just call an Uber than it is to wait 25 minutes for a bus and then 15 more minutes for a train that’s running local on a different track, crawling through at 5mph, which is what our transit system is during (late nights and) weekends. Increased subway ridership during weekdays seems to point to the most congested part of the week being the time when transit is already working the best, while it’s not working for people during the less congested parts of the week. This only sounds counterintuitive if you’re coming from a perspective where traffic congestion is the primary reason transit isn’t working. I support tolling the bridges and tunnels, but I think Streetsblog is doing a poor job of tying it to this. I think we should have bus lanes on every bus route but I wouldn’t oversell how well they work in this city. I don’t think there are many instances where the existing bus lanes work so well that buses come close to beating a TNC driving the same route. Even if we had bus lane enforcement for “regular” drivers, we will NEVER in a million years see enforcement against institutional vehicles parking in the bus lanes. This aint Curitiba. Few of our streets are wide enough for physically-separated center-running real BRT (although we should choose center-running lanes where we can). I walk across 125th and 34th Streets all the time watching the traffic. The bus lanes are routinely blocked by NYPD, ambulances, fire, Con Ed, construction vehicles, etc. Are they parked there for a “legitimate” reason? Who’s to judge? By their standards, I’m sure they are. There are likely at least a handful of legitimate “emergencies” every day on these streets. There are healthcare institutions on both that routinely transport patients door-to-door by ambulances; there are regular 911 calls. The buses have to constantly navigate back into the other travel lane, lumbering along at walking speed. The only reason the subway works so well in NYC is that NYPD and other institutional vehicles literally can’t hijack the subway’s right-of-way and use it for their own purposes. They would if they could. This is a pretty huge assumption. What’s your basis for assuming that increasing bike lanes will generate a proportionate increase in bike trips? No. There are about 3k intersections in Manhattan, so 12k corners. With a dozen per corner, that would be over 140k Uber cars. There are only around 70k Uber cars total in the city, and they certainly aren’t all working 24/7 in Manhattan alone. Because of the attached map which shows the utterly disconnected state of PBLs in NYC today. Adding 500 miles of PBLs to this situation would create a true network with all the positive network effects added. 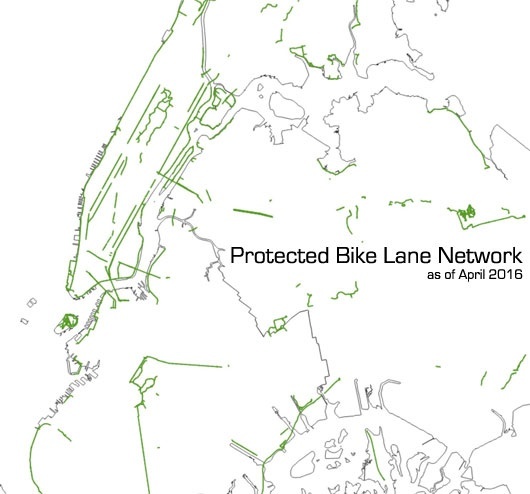 500 PBL miles represents just under 10% of all NYC streets. Rather than a linear increase which leads to the 4.5 million daily rides, one is more likely to see a geometric increase in cycling trips. 4.5 million is likely significantly under estimating latent demand. I get the argument that more PBLs would make biking more attractive (and I support more PBLs! ), but I’m wondering if there’s any data or way to forecast that potential increase. When PBLs were put in on Second Avenue, for example, how did bike traffic change vs. the overall change in city bike usage? why don’t they walk ? Why limit them, and not other road users? Yellow cab limit was an effort to guarantee revenue to drivers (a goal which has since been entirely captured by medallion holders). Charging for mileage driven, as suggested above, seems like the right call, but it should apply equally to all vehicles. Bikeshare programs really should qualify for transit dollars. Parking shouldn’t. If the weather’s nice, the Citibike is a good option. During the winter, or if it’s raining, the Uber Pool/Via is pretty darn attractive. BUT it rains/snows less than 50 days a year ( not counting drizzles ) AND in winter the same warm clothes you wear walking is fine for a Citibike SOOOO why wouldn’t Citibike be used for 3/4 of your commuting trips ? not preaching just honestly am trying to understand preferences and decision making. If you work say 200 days a year times 2 equals 400 commenting days per year…. how many Citibike trips would you guess you take annually ? generally PBLs increase bike counts by 30%, BUT these are not networked PBLs so going to be difficult to nail down a good number. PBL network so at least one has a rough measure of before vs. after. Lower Manhattan experiences near Amsterdamm levels of cycling on streets with PBLs. According to a quick Google, it rains or snows about 120 days/year in NYC. Also, if there’s any ice on the roads, I’m not riding. If I take out days when I’m traveling, getting to the office early (before 7AM), or leaving late, we’re probably at 200 trips/year. About 25-30% of those are Citibike, at a guess. Fundamentally, the ideal solution to me for commuting is a car that will drive me point to point. That way, I can work or read. The primary reason I’ll do something else is if it’s either faster or materially cheaper. See now they’re becoming a problem for traffic and the environment too! People need to just say goodbye to Uber & Lyft and go back to taxis. I use the taxi app E-HAIL (www.goehail.com) same convenience but a classic taxi ride. You said “PBL” nine times without defining it. A report published today by taxi savant Bruce Schaller pins Manhattan's current traffic meltdown squarely on the relentless growth in Uber, Lyft, and other app-based for-hire vehicles. Something's always bothered you about the app-based taxis, but you couldn't put your finger on it. Well, how's more traffic, less transit trips, more traffic deaths and greater social stratification for you? Yesterday, analyst Bruce Schaller published a groundbreaking report on the effect of Uber and other ride-hailing services on New York City streets and traffic. Schaller relied on copious trip data from ride-hailing companies to produce the report. But that same data, would not be obtainable under the disclosure provisions in Governor Cuomo's statewide "Uber" bill. The City Council is on the verge of passing bills that will help workers in the for-hire car industry and cut down on excess traffic. It's up to Mayor de Blasio to follow through on a powerful policy proposal to change the for-hire vehicle industry for the better.